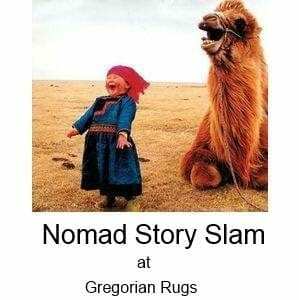 Come join us 7:30 Friday night at Gregorian Rugs for the 17th Nomad Story Slam. If you’ve never been, you’ll love this Moth Radio Hour inspired event. Anyone can come and throw their name in the hat and tell a true 5 minute story on the theme of the night – “timing is everything”. Melanee Addison is a great storyteller who will be featured on an upcoming episode of PBS’s nationally broadcast Stories From the Stage. Steve Siegel from Newton’s School Committee will also be on hand to tell a tale out of school. Steve missed last year’s Election Edition story slam and we’ve been trying to recruit him ever since. Maybe the best one yet – a capacity crowd and a hat full of great stories – thanks to everyone that made this happen, especially the storytellers.